On Thursday, the US dollar showed ambiguous dynamics against New Zealand one in view of the release of statistics from the United States. Favorable factors for USD were a reduction of the number of Continuous Jobless Claims in August to 1.707 million, as well as a decrease in the number of Initial Jobless Claims to 203K, which is 11K below the forecast. At the same time, the slowdown of employment growth in the private sector (increase by 163K versus the forecast of 190K and the previous figure of 217K), the decrease in Markit Services PMI to 54.7 points, and the reduction of production orders for 0.8% had a negative impact on USD. Investors are preparing for the Friday release of August data from the US labor market. The unemployment rate is expected to decrease from 3.9% to 3.8%, and the number of Nonfarm Payrolls may grow from 157K to 191K. The market is expected to be highly volatile. On H4 chart the instrument was corrected to the midline of Bollinger Bands, the price range is narrowing. MACD histogram is in the negative zone keeping a signal for the opening of short positions. Resistance levels: 0.6585, 0.6615, 0.6632, 0.6685, 0.6727. Short positions may be opened from the current level with the target at 0.6530 and stop loss at 0.6615. Implementation time: 1-3 days. 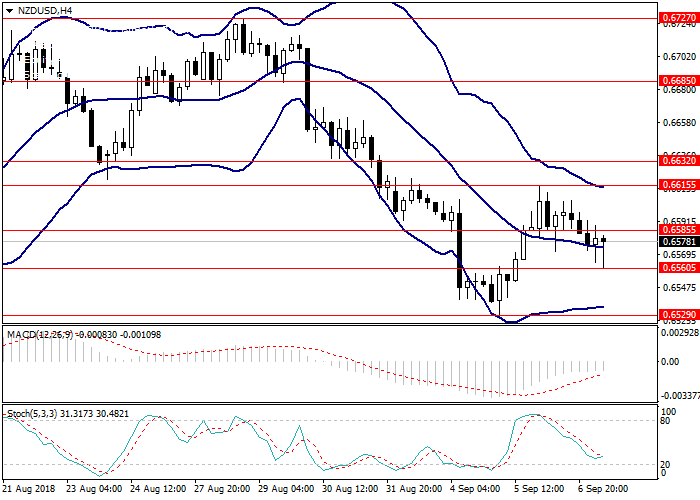 Long positions may be opened from the level of 0.6632 with the target at 0.6727 and stop loss at 0.6585. Implementation time: 3-5 days.